As solicitor Sally Clark is cleared by the Court of Appeal of murdering her two sons, more than two years after she began a life sentence, BBC News Online looks at the day her ordeal came to an end. Sally Clark was convicted in 1998. Three judges at the Court of Appeal have now ruled that the conviction was "unsafe", after hearing that evidence at the original trial had been misleading. "We have all lost out"
Speaking outside the Court of Appeal, Mrs Clark told of her relief, and asked that she and her husband be given some privacy to "grieve for our little boys". "Sally is a resillient spirit"
Judges ruled that the jury who convicted Mrs Clark did not hear evidence which could have influenced them. 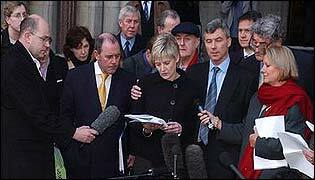 Solicitor Marilyn Stowe, who obtained a key medical report for Sally's appeal, told of her relief. Marilyn Stowe: "I've been very nervous"
George Osborne: "It's fantastic news"
Judges singled out medical evidence given at her first trial for criticism in their ruling. Microbiologist Dr David Drucker, who has helped to identify a 'cot death gene', became involved in Mrs Clark's case because he was concerned about statistical evidence used against her. Dr David Drucker: "Losing two children isn't as rare as jurors were led to believe"
Anne Diamond, whose son died from cot death: "She has a lot of grieving to do"